The Cedar Lake collection is handcrafted from carefully selected and hand-peeled Northern White Cedar logs. The peeling process leaves some inner bark on the logs, accentuating the logs natural character and beauty. The naturally aged cedar logs used are rich in character from nature herself and may feature beetle marks, burls, gnarls and other, rustic character. The logs are tenoned to enforce rigid construction. 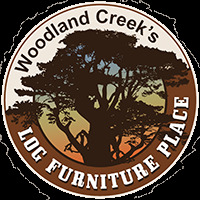 Every piece of our Cedar Lake collection of log furniture is handcrafted to be beautiful and unique. Choice of 3 table sizes. 2" solid wood, naturally distressed table top w/ natural log banding. Some minor assembly required - table tops ship unattached. Dining chairs may have a lower or higher Estimated Production Completion timeframe. Due to the difficulty of working with Liquid Glass, it may slightly extend Estimated Production Completion timeframe.